This is technically Jupiter's finest intermediate level baritone saxophone, but it is absolutely presentable in professional environments. The Jupiter JBS1100SG Intermediate Baritone Saxophone features gold-lacquered brass body and key material, a hand-hammered brass neck. The key range spans from high F# to low A. It has tilting G#- and Bb table keys, upper and lower stack adjustment screws, a front F key, blued steel springs and metal tone boosters. This horn will be welcome in nearly every professional performance context, but it is offered at a price that is not out of the question for an individual motivated student or for a school system. 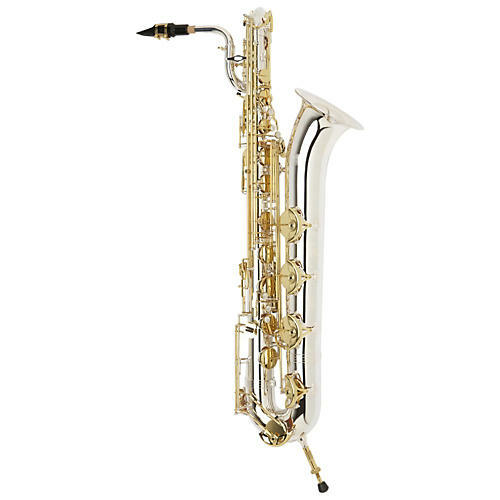 It is reliable, intonates well, sounds fantastic and will give a player every opportunity to succeed and excel on the baritone saxophone.